Google+ has these really cool things called Hangouts where you can go and video chat with up to 9 other people. As if that’s not cool enough, there are Hangouts On Air where the chat is live-streamed and recorded where it saved on YouTube for everyone to watch. I thought it would be cool to do panels on different topics having to do with pet blogging. The first one will be soon. I’ll announce it once everything is set up, but I wanted to share some possible topics for future Hangouts On Air to see if any bloggers would be interested in joining in as a member of the panel. They’ll be in and interview/Q&A type format. If you are interested in joining in, just complete the form at the bottom of the post and include which topics you be interested in being a part of. To keep the Hangout from going to long, I will most likely limit the number on each panel to 3. And to start I’ll do 1 a month and see how it goes. Let me know if you have any topics you think would be good for a Hangout in the comments. It can be about something having to do with blogging like time-saving, SEO, (if you have knowledge about a topic like these and want to share, please include in the form at the bottom. We don’t have to have a panel for these hangouts) etc or a pet blogging microniche like the topics below. 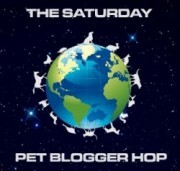 And please join us in the Pet Bloggers Community on G+! Please feel free to share with other pet bloggers! A good dog lets nothing keep him down and Marta from A Husky’s Life shares just what her Siberian Husky can do living with epilepsy. Marta shares the happenings of Rocco and his 2 feline cohorts – Vasco and Ilyich along with product reviews, health information, travel adventures and more! My name is Marta and I am a professional cat sitter/nurse and soon to be registered small animal massage therapist. I share my life with 3 furry boys (and one, less furry, man) – two cats and a dog. They are three very unique personalities and come with quirks and peculiarities of their own. Vasco, my youngest cat, runs the show and bosses us around. The oldest, Ilyich, is a shy and bit neurotic Siamese cross. Rocco is a special-needs Siberian Husky, truly a girl’s best friend! As a child, growing up on the outskirts of a large city, I was surrounded by dogs and cats (and cows and goats and sheep J). However, I do have to credit my grandfather for instilling in me the curiosity and love for animals. I was definitely one of those kids who preferred to spend time playing with and “training” her cats and dogs. While working with animals, I come across a lot of very helpful information and some great stories, too. I felt like I needed an outlet. Also, after adopting Rocco, I realized that talking about my dog 24/7 might drive some people up the wall. So, I decided to start a blog and use it as an avenue to connect with people who love to read about animals and who want to look at an endless stream of cute pet pictures J After Rocco’s brush with death, the blog also serves me as a photo-diary where I can document the wonderful moments I spend with my gang. For about 3 years. However, in the past year, I’ve been putting more effort into keeping my blog updated on a regular basis. Bites and Tales is a mixed bag of photos, videos, personal stories, tips, tricks and pet related information gathered through my work, research and/or experience. Best: meeting new people, making connections and being able to talk about my pets to my heart’s content! That there are many kind and generous people out there, who are more than willing to open up to a complete stranger and provide them with encouragement and support. The pet community is a very friendly and caring place. Keep at it and be active within the pet blogging community. Thank you Marta for being interviewed!